The Governor and the Treasurer have agreed that the appropriate target for monetary policy in Australia is to achieve an inflation rate of 2–3 per cent, on average, over the cycle. May I ask why the RBA does not consider house prices when deciding whether to raise rates, lower them or leave them as they are? My understanding is that it’s your job to keep inflation under control. 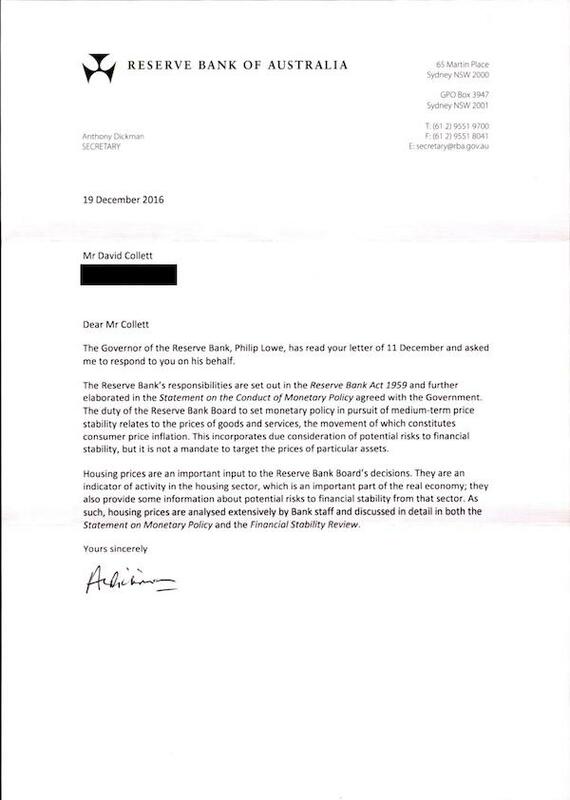 The Governor of the Reserve Bank, Philip Lowe, has read your letter of 11 December and asked me to respond to you on his behalf. The Reserve Bank’s responsibilities are set out in the Reserve Bank Act 1959 and further elaborated in the Statement on the Conduct of Monetary Policy agreed with the Government. The duty of the Reserve Bank Board to set monetary policy in pursuit of medium-term price stability relates to the prices of goods and services, the movement of which constitutes consumer price inflation. This incorporates due consideration of potential risks to financial stability, but it is not a mandate to target the prices of particular assets. Housing prices are an important input to the Reserve Bank Board’s decisions. They are an indicator of activity in the housing sector, which is an important part of the real economy; they also provide some information about potential risks to financial stability from that sector. As such, housing prices are analysed extensively by Bank staff and discussed in detail in both the Statement on Monetary Policy and the Financial Stability Review. Thank you for your letter of 19 December 2016. 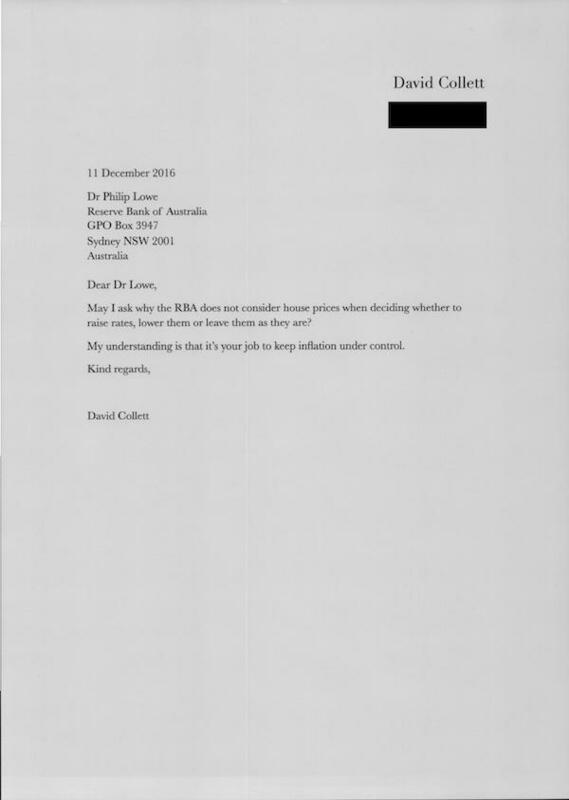 In your letter you stated that the duty of the RBA is to pursue medium-term price stability related to the prices of goods and services, excluding the prices of particular assets. While I am not a lawyer, the way I read the above section of the Act is that it’s the RBA’s duty to make sure monetary policy is directed to the greatest advantage of the people of Australia and that the RBA must also, in the opinion of the Reserve Bank Board pursue currency stability, full employment and the economic prosperity and welfare of the people of Australia. Let’s say there’s a young man in the Australian workforce right now called Bernie. He’s 26 years old, has a university degree with a corresponding HECS debt, has been working full-time for three years and is already earning the average wage of $78,832 (1) which means that after tax, medicare and his HECS repayments, Bernie has a net income of $1,086.21 per week and he lives in Melbourne. Let’s also assume that Bernie’s parents are not in a financial position to be able to help him in any way, that no relatives are going to pass away in the near future and that all his friends are busy dealing with their own financial situations. The point being that if Bernie wants to purchase something, he has to save the money himself or borrow from an Australian lender. Bernie is currently living by himself in a one bedroom unit in Ascot Vale VIC, paying $275 per week in rent. Bernie’s primary financial goal is to enter the property market and purchase a one bedroom unit that he can live in as an owner occupier. Bernie currently has $47,840 in a three month term deposit earning 2.50%. He saved this money by putting aside $200 per week in his first year of work, $300 per week in his second year of work and $420 per week in his third year of work. 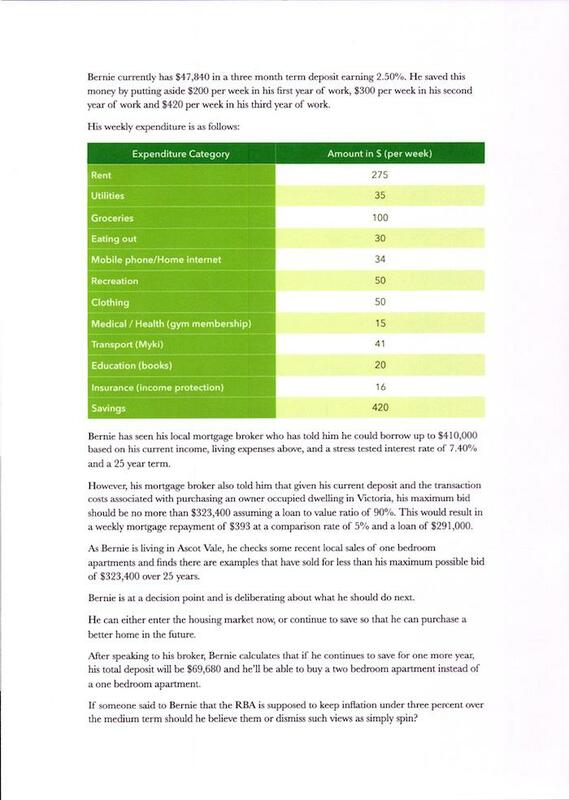 Bernie has seen his local mortgage broker who has told him he could borrow up to $410,000 based on his current income, living expenses above, and a stress tested interest rate of 7.40% and a 25 year term. However, his mortgage broker also told him that given his current deposit and the transaction costs associated with purchasing an owner occupied dwelling in Victoria, his maximum bid should be no more than $323,400 assuming a loan to value ratio of 90%. This would result in a weekly mortgage repayment of $393 at a comparison rate of 5% and a loan of $291,000. As Bernie is living in Ascot Vale, he checks some recent local sales of one bedroom apartments and finds there are examples that have sold for less than his maximum possible bid of $323,400 over 25 years. Bernie is at a decision point and is deliberating about what he should do next. He can either enter the housing market now, or continue to save so that he can purchase a better home in the future. After speaking to his broker, Bernie calculates that if he continues to save for one more year, his total deposit will be $69,680 and he’ll be able to buy a two bedroom apartment instead of a one bedroom apartment. If someone said to Bernie that the RBA is supposed to keep inflation under three percent over the medium term should he believe them or dismiss such views as simply spin? If he was going to believe them, should he assume that the biggest purchase of his lifetime is also being tracked by the RBA and accurately factored into the inflation figure the RBA uses to set the cash rate each month? 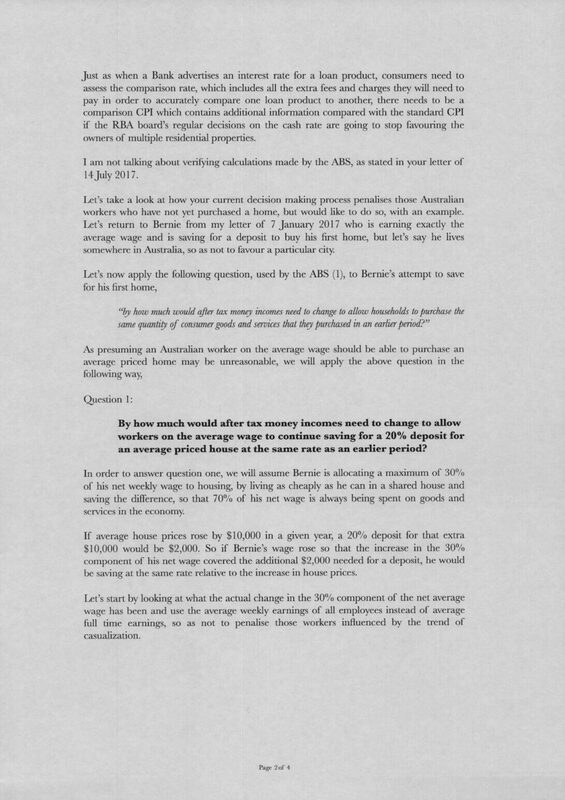 If someone said to Bernie that the measure of inflation the RBA uses from the ABS presumes workers such as Bernie are only spending $101.72 in rent per week (2) should he believe them or dismiss them? If someone said to Bernie that the measure of inflation the RBA uses from the ABS presumes people only buy new houses without land and workers in his situation usually spend $131.44 per week on their new house, should he believe them or ignore them? 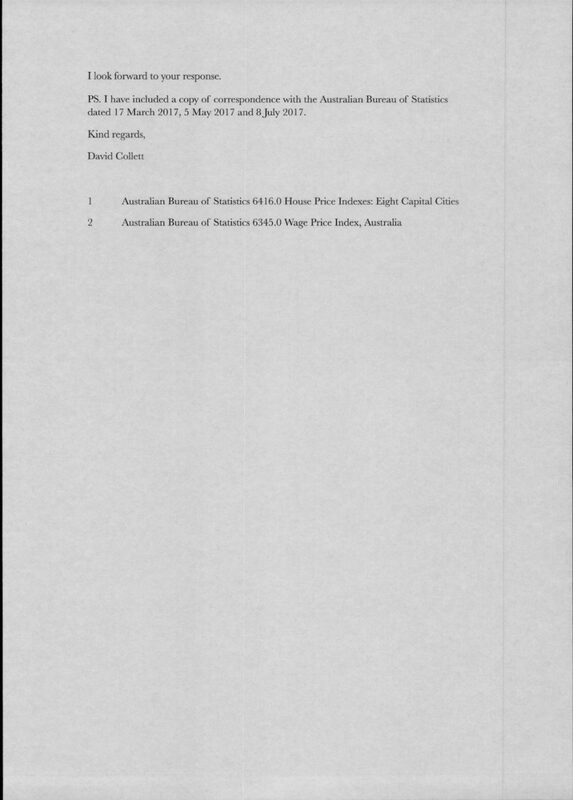 If someone said to Bernie that when the Reserve Bank Board meets each month to carry out it’s duty of setting the cash rate to the greatest advantage of the people of Australia, the board members consider “the people of Australia” to only refer to homeowners who are about to downsize and property investors who own multiple properties (as they are the main two groups who will receive a net benefit from rising house prices), should he believe them or dismiss them? Given all of the above, let’s assume there was a change of Government and both the new Treasurer and the Governor-General were of the opinion that inflation was currently above three percent per annum and that the RBA should increase the cash rate, but the RBA believed inflation was currently below three percent and therefore that the cash rate should remain unchanged. 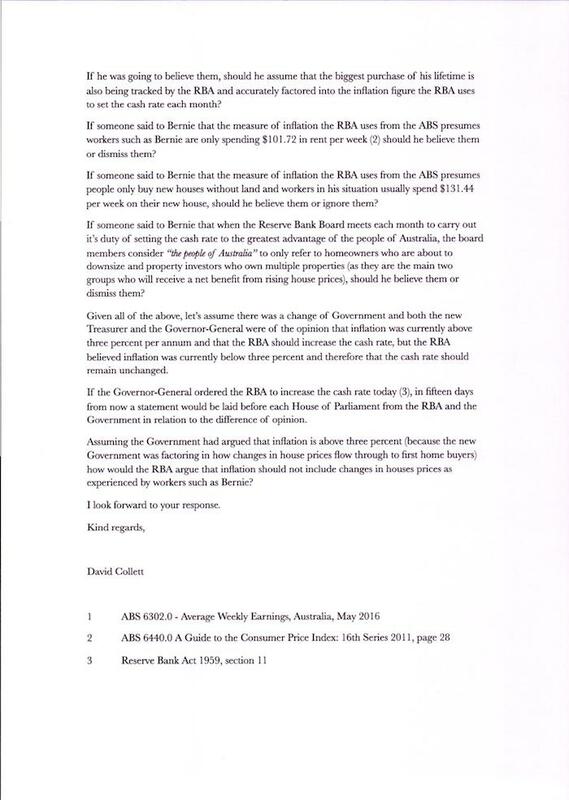 If the Governor-General ordered the RBA to increase the cash rate today (3), in fifteen days from now a statement would be laid before each House of Parliament from the RBA and the Government in relation to the difference of opinion. Assuming the Government had argued that inflation is above three percent (because the new Government was factoring in how changes in house prices flow through to first home buyers) how would the RBA argue that inflation should not include changes in houses prices as experienced by workers such as Bernie? 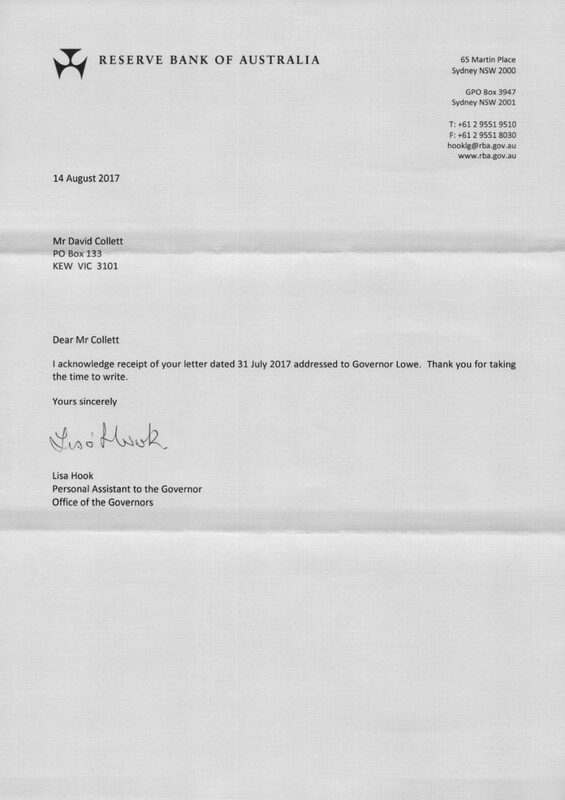 Thank you for your further letter dated 7 January, addressed to the Governor, Philip Lowe, and the hypothetical example you cite. As noted in our previous response, dated 19 December 2016, the Reserve Bank Act 1959 and the Statement on the Conduct of Monetary Policy mandate the Bank to target consumer price inflation, that is, the rate of change in the prices of a basket of goods and services. The rate of inflation at a point in time is not a matter of belief or perception; it is calculated by the Australian Bureau of Statistics, an independent Commonwealth agency. The Reserve Bank does not target the level of asset prices, although housing price are taken into account in the Bank’s policy deliberations. The Reserve Bank Act does indeed give the Government a mechanism to override a decision of the Reserve Bank Board, but it has never been used. It would be a significant event if this were to happen. The Board’s duties in setting monetary policy relate to the welfare of the people of Australia as a whole. It would not be consistent with that duty to set policy in a manner that favours people living in a particular city, or those who already own property or who do not but would like to do so. Thank you for your reply of 28 February 2017. Which Statement on the Conduct of Monetary Policy are you referring to? Are the above seven statements the only statements I should be referring to in order to understand the existing agreement between the Government and the RBA on monetary policy? May I ask why the current Series CPI does not include mortgage payments, mortgage interest payments and the price paid for a dwelling? Surely the current CPI figures cannot be used as a realistic measure of inflation for households for macroeconomic policy decision making when the largest purchase most consumers will make in their lifetime is excluded from the index. While I presume dwelling purchases by investors who are only acquiring an income producing asset should be excluded, the same should not be true for an owner-occupier purchase because there is a large amount of utility in owning one’s own home. Inflation data ‘very poor’ cost of living measure due to house price exclusion. Australia’s main official cost of living measure, the consumer price index, is failing young Australians by excluding home purchase costs, argues an economist from Australia’s largest bank. Thank you for your letter of 17 March 2017 regarding the Consumer Price Index. 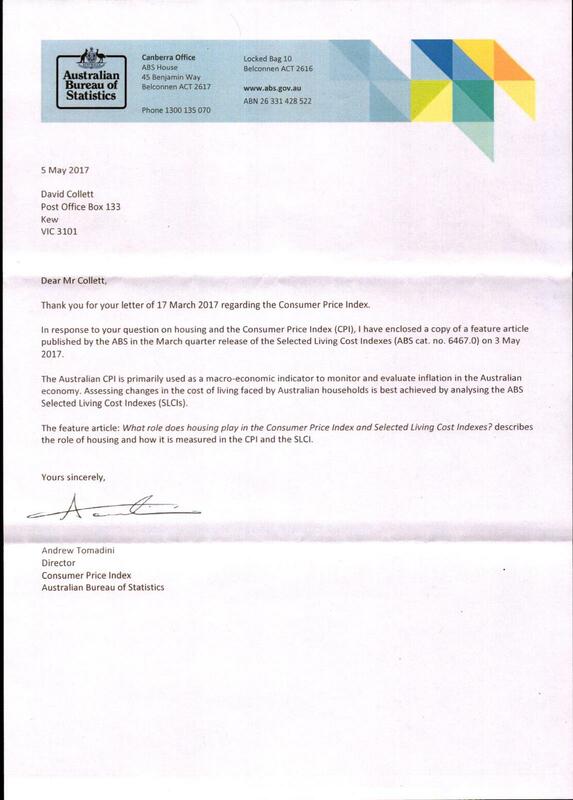 In response to your question on housing and the Consumer Price Index (CPI), I have enclosed a copy of a feature article published by the ABS in the March quarter release of the Selected Living Cost Indexes (ABS cat. no. 6467.0) on 3 May 2017. The Australian CPI is primarily used as a macro-economic indicator to monitor and evaluate inflation in the Australian economy. 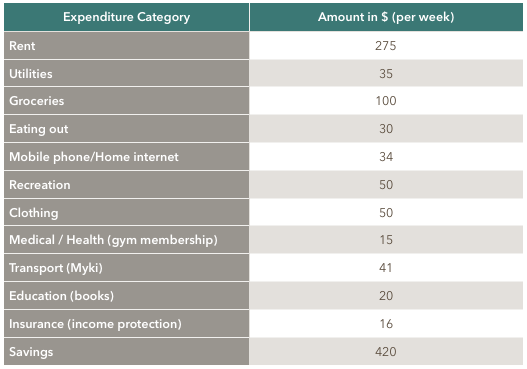 Assessing changes in the cost of living faced by Australian households is best achieved by analysing the ABS Selected Living Cost Indexes (SLCIs). The feature article: What role does housing play in the Consumer Price Index and Selected Living Cost Indexes? describes the role of housing and how it is measured in the CPI and the SLCI. Thank you for your reply of 5 May 2017. Could you please point me to a publicly available document that sets out how “6467.0 Selected Living Cost Indexes” has been constructed, just as “6461.0 Consumer Price Index: Concepts, Sources and Methods” helps to explain how “6401.0 Consumer Price Index, Australia” is constructed, which is used by the Reserve Bank of Australia to make macroeconomic policy decisions. Thank you for your letters of 19 December 2016 and 28 February 2017. 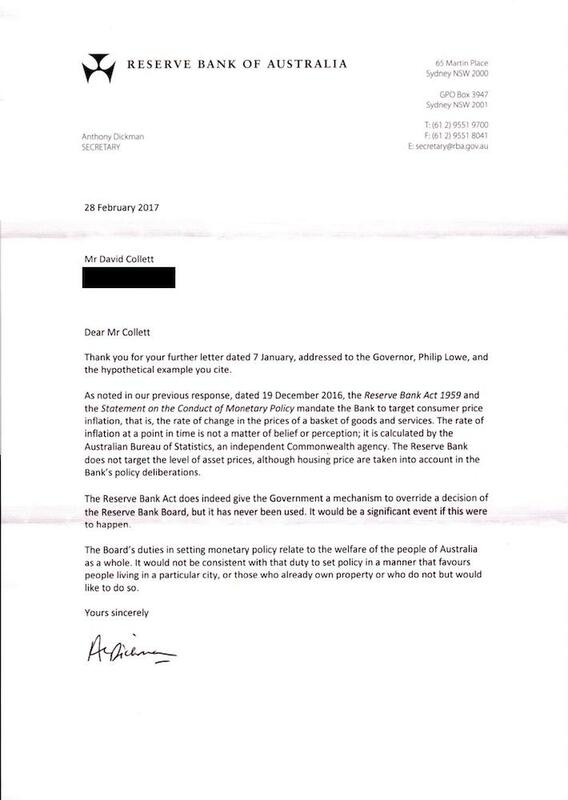 I write this letter knowing that ultimately the Treasurer is responsible for administering both the Reserve Bank Act 1959 and the Australian Bureau of Statistics Act 1975 as ordered by the Governor-General on 1 September 2016. Could the Treasurer challenge you on monetary policy? The question is not whether the Treasurer should challenge you. Obviously, if the Treasurer had a difference of opinion with the RBA on monetary policy the first step should be a series of private discussions. Making a challenge as per section 11 of the Reserve Bank Act 1959 should be viewed as an absolute last resort. The question is not whether it’s likely the Treasurer will challenge you. Even though it would be unlikely for the current Government to hold a difference of opinion with the RBA board on monetary policy, there are signs a Labor Government could, given their interest in tackling more substantive issues such as negative gearing. 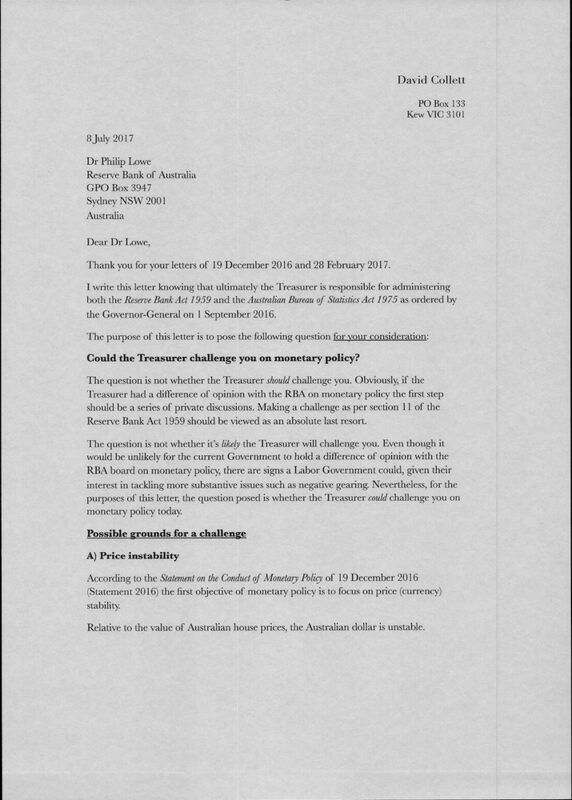 Nevertheless, for the purposes of this letter, the question posed is whether the Treasurer could challenge you on monetary policy today. According to the Statement on the Conduct of Monetary Policy of 19 December 2016 (Statement 2016) the first objective of monetary policy is to focus on price (currency) stability. 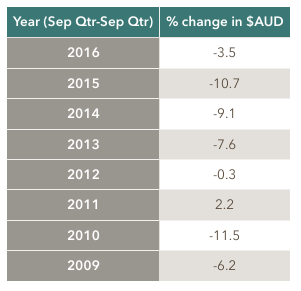 Relative to the value of Australian house prices, the Australian dollar is unstable. Does house price inflation create the conditions for households to make bad decisions with regard to purchasing or not purchasing a home? Both the Reserve Bank and the Government agree on the importance of low and stable inflation. Effective management of inflation to provide greater certainty and to guide expectations assists businesses and households in making sound investment decisions. …They agree that an appropriate goal is to keep consumer price inflation between 2 and 3 per cent, on average, over time. If an appropriate environment for households to make spending decisions on food and clothing is an aggregate maximum annual price change of 2-3 per cent, then would it not be likely that a maximum annual price change in average house prices of up to 3 per cent would be a better environment to make purchase decisions in compared with 7.5%, 9.1%, 10.7% and 11.5% annual price changes? The answer is obvious. If house prices were stable over the medium term, consumers would give more weight to whether they wanted to live in a house, not whether they can own the house for a few years while it’s value increases by 10% per year because others are willing to take on more debt than they are. If house prices were stable over the medium term, workers who do not own a home would be less disadvantaged compared with workers who already own a home in terms of saving for a deposit. 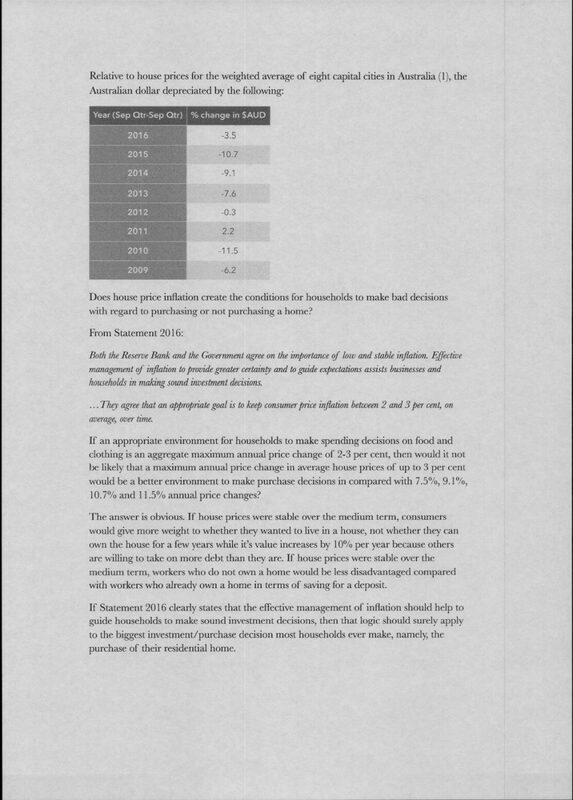 If Statement 2016 clearly states that the effective management of inflation should help to guide households to make sound investment decisions, then that logic should surely apply to the biggest investment/purchase decision most households ever make, namely, the purchase of their residential home. B) Turning a blind eye to deficiencies in how the CPI series is constructed. Let’s say it’s your first day with the RBA and your job is to keep inflation under control in Australia. You’re handed a factsheet with two tables. The first table shows the annual percentage change in food prices in Australia and the annual percentage change in private sector wages and the second shows house prices and wages. Given the above, which one of the following responses would be most appropriate? Do nothing because you assume the Australian Bureau of Statistics includes food in the CPI figures with an appropriate weighting relative to other household items so you can simply wait to see if the CPI figure is either within the 2-3% range or above/below. Check for yourself whether the ABS has an appropriate weighting for food in their CPI series to make sure the increases in food prices are not being under represented in the final CPI figures. Do nothing because you assume the Australian Bureau of Statistics includes house prices in the CPI figures with an appropriate weighting relative to other household items, so you can simply wait to see if the CPI figure is either within the 2-3% range or above/below. Check for yourself whether the ABS has an appropriate weighting for house prices in their CPI series to make sure the increases in house prices are not being under represented in the final CPI figures. PS. 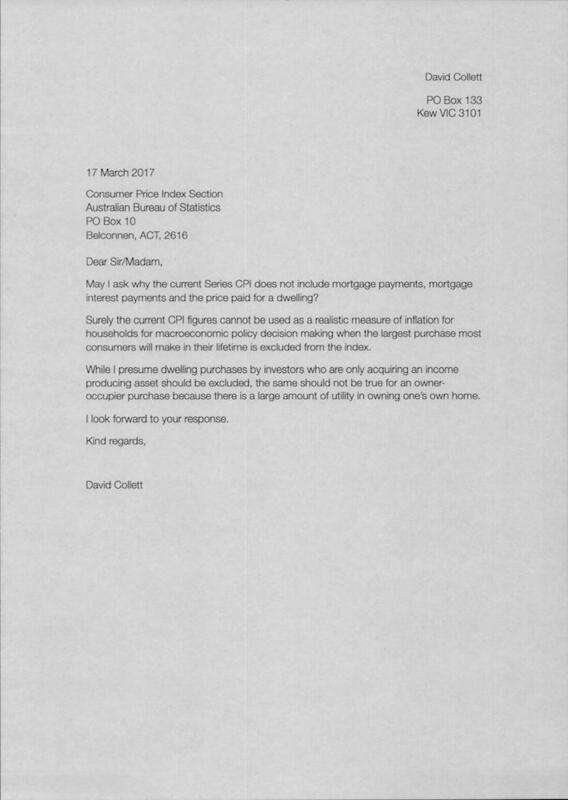 I have included a copy of correspondence with the Australian Bureau of Statistics dated 17 March 2017, 5 May 2017 and 8 July 2017. 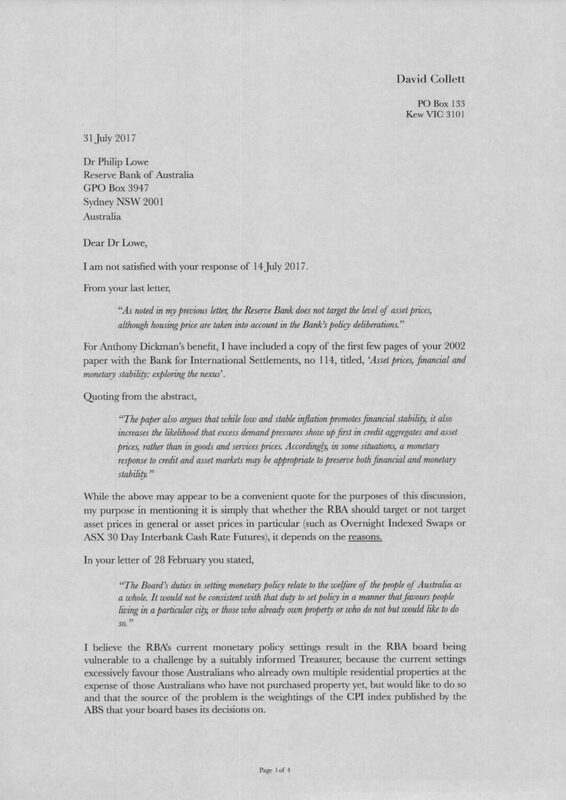 Thank you for your most recent letter of 8 July to the Governor of the Reserve Bank, Philip Lowe. He has read your letter, including your correspondence with the ABS, and asked me to respond on his behalf. 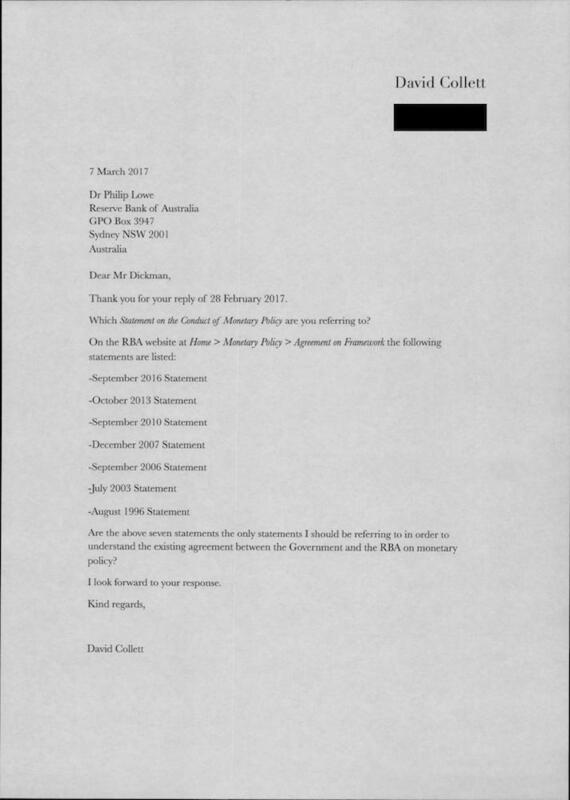 I have little to add to my letter to you dated 28 February, in which I noted that the Reserve Bank Act 1959 does indeed give the Government a mechanism to override a decision of the Reserve Bank Board. This mechanism has never been used and it would be a significant event if this were to occur. Furthermore, the Governor is not inclined to speculate on possible responses to hypothetical scenarios. 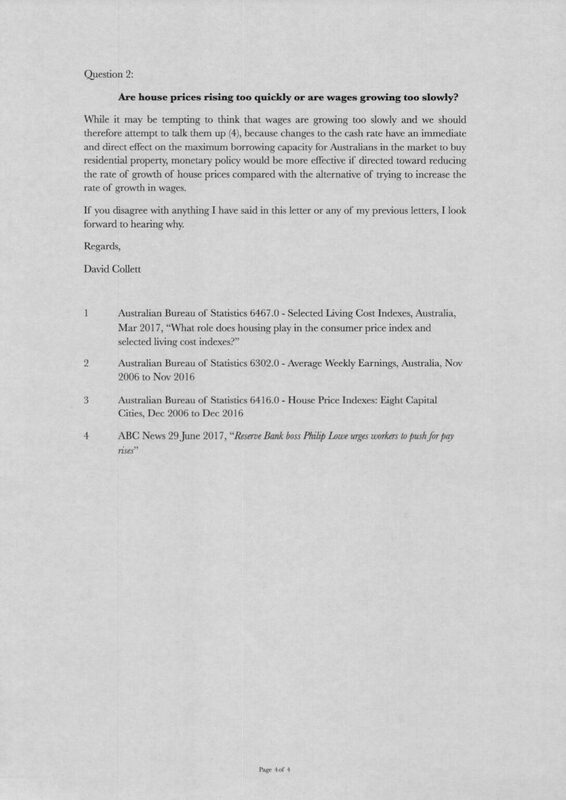 As noted in my previous letter, the Reserve Bank does not target the level of asset prices, although housing price are taken into account in the Bank’s policy deliberations. The inflation target is specified in terms of consumer price inflation, which is measured by the ABS, an independent Commonwealth agency. 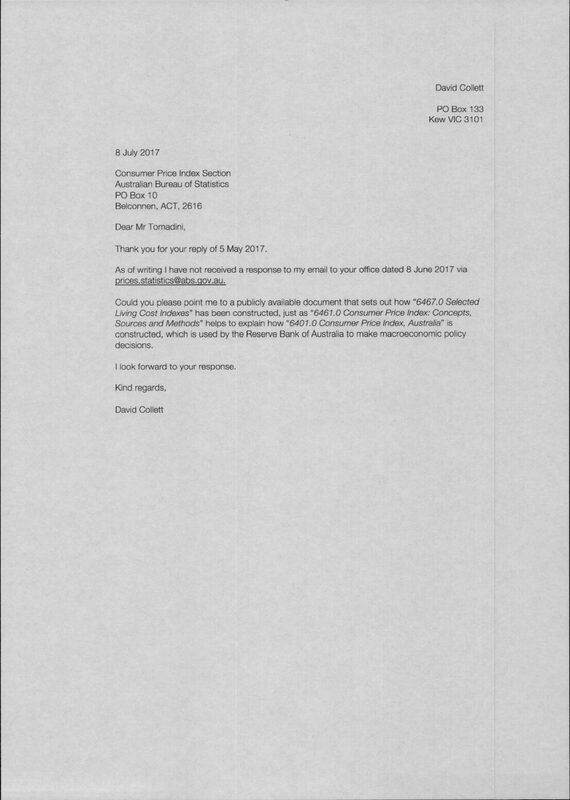 It is not the Reserve Bank’s role to verify calculations made by the ABS. The Reserve Bank of Australia looks to be shifting tentatively towards ending more than four years of emergency monetary policy support, putting households on notice it has pegged 3.5 per cent as the new normal for the cash rate, equivalent to eight rate hikes above today’s level. I am not satisfied with your response of 14 July 2017. For Anthony Dickman’s benefit, I have included a copy of the first few pages of your 2002 paper with the Bank for International Settlements, no 114, titled, ‘Asset prices, financial and monetary stability: exploring the nexus’. While the above may appear to be a convenient quote for the purposes of this discussion, my purpose in mentioning it is simply that whether the RBA should target or not target asset prices in general or asset prices in particular (such as Overnight Indexed Swaps or ASX 30 Day Interbank Cash Rate Futures), it depends on the reasons. I believe the RBA’s current monetary policy settings result in the RBA board being vulnerable to a challenge by a suitably informed Treasurer, because the current settings excessively favour those Australians who already own multiple residential properties at the expense of those Australians who have not purchased property yet, but would like to do so and that the source of the problem is the weightings of the CPI index published by the ABS that your board bases its decisions on. Just as when a Bank advertises an interest rate for a loan product, consumers need to assess the comparison rate, which includes all the extra fees and charges they will need to pay in order to accurately compare one loan product to another, there needs to be a comparison CPI which contains additional information compared with the standard CPI if the RBA board’s regular decisions on the cash rate are going to stop favouring the owners of multiple residential properties. I am not talking about verifying calculations made by the ABS, as stated in your letter of 14 July 2017. Let’s take a look at how your current decision making process penalises those Australian workers who have not yet purchased a home, but would like to do so, with an example. Let’s return to Bernie from my letter of 7 January 2017 who is earning exactly the average wage and is saving for a deposit to buy his first home, but let’s say he lives somewhere in Australia, so as not to favour a particular city. By how much would after tax money incomes need to change to allow workers on the average wage to continue saving for a 20% deposit for an average priced house at the same rate as an earlier period? In order to answer question one, we will assume Bernie is allocating a maximum of 30% of his net weekly wage to housing, by living as cheaply as he can in a shared house and saving the difference, so that 70% of his net wage is always being spent on goods and services in the economy. If average house prices rose by $10,000 in a given year, a 20% deposit for that extra $10,000 would be $2,000. So if Bernie’s wage rose so that the increase in the 30% component of his net wage covered the additional $2,000 needed for a deposit, he would be saving at the same rate relative to the increase in house prices. Let’s start by looking at what the actual change in the 30% component of the net average wage has been and use the average weekly earnings of all employees instead of average full time earnings, so as not to penalise those workers influenced by the trend of casualization. 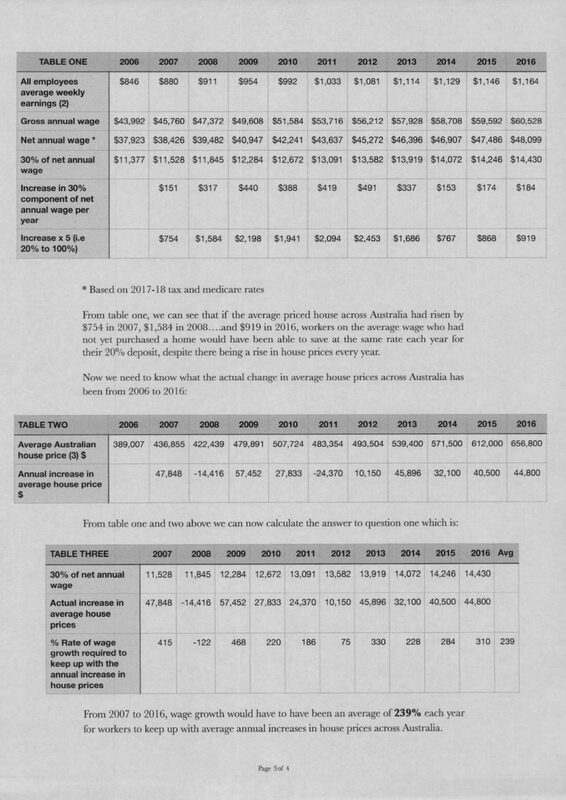 From table one, we can see that if the average priced house across Australia had risen by $754 in 2007, $1,584 in 2008….and $919 in 2016, workers on the average wage who had not yet purchased a home would have been able to save at the same rate each year for their 20% deposit, despite there being a rise in house prices every year. From 2007 to 2016, wage growth would have to have been an average of 239% each year for workers to keep up with average annual increases in house prices across Australia. Are house prices rising too quickly or are wages growing too slowly? While it may be tempting to think that wages are growing too slowly and we should therefore attempt to talk them up (4), because changes to the cash rate have an immediate and direct effect on the maximum borrowing capacity for Australians in the market to buy residential property, monetary policy would be more effective if directed toward reducing the rate of growth of house prices compared with the alternative of trying to increase the rate of growth in wages. If you disagree with anything I have said in this letter or any of my previous letters, I look forward to hearing why. It would be interesting to graph (1) real average home prices in Australia, (2) real average full time adult wages, and (3) the labour share of GDP, showing how all three have moved since about 1975. It seems as though house prices have substantially outstripped wages growth – and that while wage growth has been modest, the labour share of GDP has fallen (rather unevenly – but overall) over the same period. This suggests that there is room for wage growth, but mass immigration mitigates against ‘wage pressure’ – according to the ACCI anyway – and coincidentally adds to upwards pressure on housing prices. 1. Reduce Australia’s net overseas immigration to about 35,000 per year, the same as it was under Paul Keating in 1993. 2. Limit negative gearing on investment properties to new builds only, starting asap. 3. Put a moratorium on foreign investment in residential real estate for 5 years, pending stabilisation of the market. Review in 5 years. I applaud your approach, which is to look at the structures and rules in place. It certainly beats the approach of just complaining about prices or demanding ‘0% price inflation’ without any mechanism to achieve it. FYI, in the UK, the CPIH includes housing costs. No-one quotes the statistic. The root cause of high house prices is that private Banks create money from nothing through the process of making loans. Think of your credit card: there is no money behind it, yet you can buy something and the vendor gets money in their account. It was a loan to you by the bank: it was not a transfer, you caused new money to pop into existance. Mortgages are the same: you sign a piece of paper promising to pay back $100k. The bank parks this in the Asset column, and types 100000 into a computer in your name, the balancing Liability. It wasn’t Granny’s savings: it was brand new money. At that moment average house prices in Australia just went up $0.06 (say). Multiply that by 500,000 mortgages a year and you have unaffordable housing. The RBA is not in control: private, high street banks are, and it’s very profitable. The make up money for free then rent it to you for 25 years. So if you want to cause house prices to be set, instead, by supply and demand, you need to lobby to strip private companies of the power to make money for the purposes of their profit. This has happened before, for similar reasons (runaway money printing): the UK 1844 Bank Charter Act. There are multiple campaign groups worldwide on the issue, such as Positive Money in the UK. MoMo in Switzerland has forced a referrendum on the issue. Hi Mike, thank you for your comment and the links. Many years ago Positive Money were the first ones to alert me to the money creation issue. 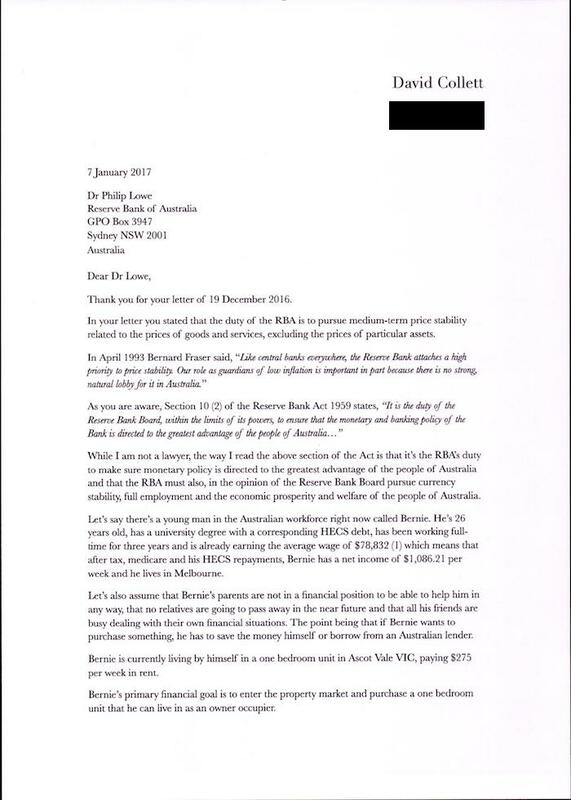 Here is an argument with the RBA about that: https://www.taxpayersparty.com.au/open-letter/rba-full-reserve-banking/ . It partly comes under the RBA’s responsibility because the new money flows through the payments system which the RBA have a responsibility for. A bit like the CBA scandal here with money being deposited into ATM’s and therefore an issue for CBA. Did I get something wrong or did you not like my comment? I’d have thought a rational argument explaining the root cause of house price inflation, with cited sources, would be of interest. Huh! Just gone up, thanks David. I will look into your links. Apologies, my bookmark went to the August comment so I didn’t see mine had listed. Interesting links. The money multiplier model they quote is evidentially wrong. The BoE in the UK post crash created £375bn yet broad money still contracted. Banks didn’t loan that money to the economy, they sat on it to increase their reserves. Average bank gearing in 2008 was about 49x. There is no explicit limit: the banks collectively just need enough Central Bank Reserves to cover inter-bank lending. This is also why interest rates don’t really work as a control. In theory, no bank lends to another if it can borrow from the central bank more cheaply. In practice, they only need Bank of England reserves to cover inter-bank differences in clearing. So if they all balloon debt together (mostly housing and financial instruments) then broad money increases without control by the central bank. Then they lobbied for less liquid assets to be included in reserves. In the UK, you can only put business losses against business income, not personal. Recently, to calm buy-to-let, they capped mortgage interest as a business expense. Neither address root cause. House sale prices are available online from the National Land Registry (and Rightmove). Foreign ownership in London is a huge inflator, but curbing this needs control as well on shell companies. The UK is mostly privately owned so land is leaked out. We don’t actually have a house shortage, although that is the popular meme. It’s actually an affordability crisis. I always thought of Aussy as a place with plenty of land! I have come to the conclusion that only the Govt, and hence the political process, can over-rule the powerful and wealthy financial sector. Unfortunately in the UK, half the current Cabinet comes from the industry. I suggest support Vollgeld Switzerland. If they can show it works, we might make progress at home. Thank you for your comments. I’ve just had a quick look at The Bank of England Act 1998 and it’s very different to our Act for our central bank. I agree with you that most of these issues require changes in policy which requires change through the political process. From my perspective we are very lucky here in Australia because of how our central bank legislation is worded, it means we actually have a central bank that has an obligation to set monetary policy to the greatest benefit of the people of Australia and they also have a transparency mandate too. If it wasn’t for that, it would just be a very long road through the political process. I’d be interested to know if you have any political parties in the UK that don’t accept donations. That’s the one way to check whether they are serious about removing vested interests from parliament. Roughly, the Conservative/right rely on wealthy individual and corporate donations, whereas Labour/left rely on workers’ unions support and much smaller donations from more individuals. Politics is now a career, to be studied at Oxford & Cambridge before an internship then placement in a safe seat. No real job required. If you are Conservative. About half the current cabinet of 26 are millionaires. The elites have captured the system at the moment. But it took 30 years for this, and it is a long game. Democratic rule will return to the Demos, if we keep at it. 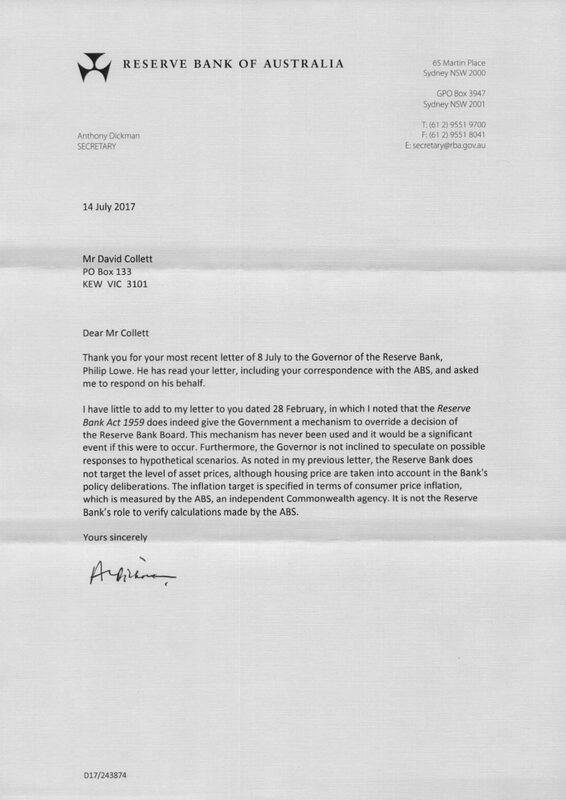 My last letter was on the specific point of re-starting a Parlimentary enquiry into Monetary Policy since 2008. The interesting Bank Act is 1844, which stripped private banks of the ability to create money for free. Sadly they didn’t predict computers (!) so your current account or mortgage (“demand deposits”) are not included.